Check out some of Dukes Pizza Plus's Latest Pizza Creations! We are always cooking up something new and exciting so be sure to check back if you haven't stopped in for a while! Do you have a suggestion? We would love to hear from you! Here are the latest and greatest from our laboratories! Gluten Free Crust Available (only available in small) • Larges Can Be Cut Into 10 Slices Upon Request! BBQ Sauce, Chicken, Red Onion, Bacon, Mild Peppers, Topped with Pepper Jack Cheese. Seasoned Steak, Mild Peppers, Roasted Red Peppers, Red Onion, Topped with Pepper Jack Cheese. BBQ Sauce, Pulled Pork, Red Onion, Bacon, Mild Peppers, Topped with Pepper Jack Cheese. 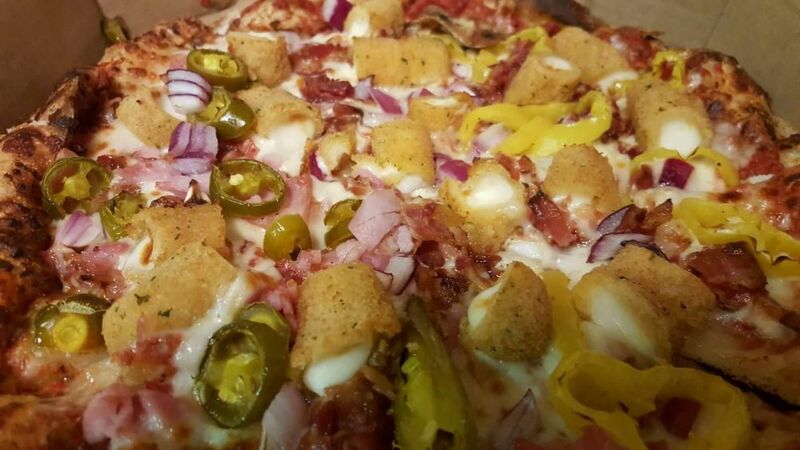 The Southerner Pizza is topped with Banana Peppers, BBQ Sauce, Chipotle Mayo Sauce, Jalapenos, Mozzarella Cheese, Pepper Jack Cheese, Red Onions, Steak. Italian dressing, garlic, salami, pepperoni, ham, sausage and cheese.